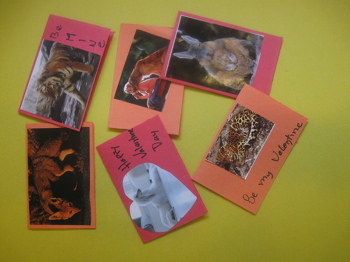 Animal-themed valentines can provide an afternoon of fun, and encourage kids to recycle and re-use old materials. Use adorable animal photos from books or magazines to make these simple valentines that can be given to classmates or friends. If you don’t have magazines on hand, try thrift stores. Before going through the magazines, figure out how many cards to make. Make four cards per piece of construction paper. Pull out as many pieces as you need. Use a ruler to measure half the width and half the length of the paper and draw a very light line with pencil. Either use scissors to cut, or make a cleaner cut with an exacto knife. To use the knife, first place a cutting board beneath the work. Then, hold the ruler along the area you want to cut, and run the exacto knife along that line to make a clean cut. Fold each card in half. For a clean fold, place a metal-edged ruler along the edge you want to fold, and run your finger along the paper to press it into the ruler edge. Carefully fold along that line. Next, go through your magazines and find the photos you want to use for the cards. Check that each photo will be the right size to fit on the front of one card. Cut the photos from the magazines. Kids can be creative and cut the photos into circles, hearts, or creative shapes, or cut them to fit the size of the front of the paper. If they want, they can use markers to embellish the photos and draw on hearts or “Happy Valentines” messages. Next, carefully glue the photos on the front of the cards. Smooth out any wrinkles and wipe away any extra glue using paper towels or extra construction paper. Allow the glue to dry. Once the glue is dry, use a marker to write messages in the inside of the card. If you’re having a party with guests, address one card per guest or write a personal message. If kids will be giving them away in class, they may prefer to write a generic “Happy Valentine’s Day” message. Now you have personal, fun cards to give away for the holiday! These cute animal valentines will make Valentine's Day a breeze. Just print them and help your child cut them out. Print out these sports valentines cards, great for kids who just aren't into the fluff and frill of Valentine's Day. These valentines will really quack you up! Sweet and old-fashioned, yet so easy; just print and cut into six. Help your child find a heartfelt way to say happy Valentine's Day with these fold-and-colour valentines. Print and colour this heart-candy-themed Valentine's Day card. Learn about coins and their value by making an animal piggy bank. 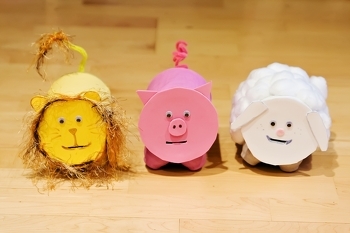 Here's how to make a lion, pig, or sheep bank! Give your child's maths skills a fun boost with these double digit animal-themed subtraction worksheets. These sweet little cards will make the day a bit easier. Just print and cut, and you're ready to go. Animal tracks tell the story of visitors you might never see. Learn how to identify some common animal tracks with this fun and simple writing exercise. What's your favorite animal? Kids love answering that question, and with this animal research graphic organizer, they can write all about it. Each animal has the same number of spots. Can your child use his multiplication knowledge to figure out how many spots in all? Your child will write about his or her favorite animal. Kids will research their favorite animals online or at the library, then write down three facts.